Are we still in love with the iPod? New iPods then. So here's a question for you - is it still cool to have one? And, more importantly for us, is it still cool to want an iPod? SanDisk may have raised a few eyebrows with its 2006 iDon't 'sheep' ad campaign aimed at dissuading potential iPod purchasers. But its core ideology rings true with a surprisingly large percentage of the interested public. Yet people have got over the problem of the white headphones. Everybody has them, so you're hardly marking yourself out as a major mugging target or one of the cool kids who can afford to shell out. People just don't think of the iPod as exclusive any longer and increasingly the music player-savvy seem to be dividing into three schools. Those who own an iPod and have succumbed to the iTunes mentality; those who own an iPod and look for ways to get round the proprietary Apple-ness; and those who own an alternative to an iPod and live free and easy away from the ties of iTunes. It's that second group that interests me. They're drawn in by the design ethic, but are more than happy to ignore Apple's proprietary systems by using Winamp or a third party app like Roxio's Easy Media Creator to copy tracks. What is clear is that fewer people are excited by the prospect of a standard iPod. 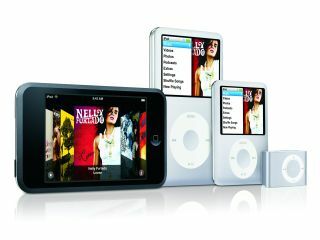 More interesting is whether last night's introduction of the OS X-based iPod touch can reignite the hunger and kudos for the iPod line. This time it's not about the form factor, but about what the device can actually do. Thankfully though, Apple has realised that people are different. It showed wisdom by keeping the high capacity iPod classic and beefing up the iPod nano, a piece of kit that simply won't excite as much as nano Mark I. Perhaps the problem is that Apple has done too much for us already. The iPod remains an iconic gadget and a large part of why people aren't as excited by the prospect of new ones is that we've been spoilt. We're just expecting too much. After all, when the iPhone is a regular sight on UK streets it's a dead-cert that none of these iPods will seem quite so delicious. Ah, there we are. It's the iPhone that's the new cool.